The Minnesota Project's blog features news, analysis, resources, musings, and events Centered on Sustainability in the areas of clean energy, local food, and conservation agriculture. 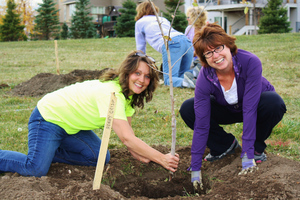 Visit our Web site to learn more about the organization and our work at www.mnproject.org. If you raise livestock, you produce manure! Consequently, proper manure disposal is a concern for most operations. Most farming operations typically use their manures as fertilizers, but there are limits to how much manure you can apply to cropland—too much manure on fields can reduce your yield and may result in a visit from the local feedlot officer. The most common disposal solution is to build a lagoon, to hold the manure for application when appropriate or for sale to interested farmers. Obviously, manure pits can produce odors offensive to nearby residents, which is why many communities have established “Right to Farm” ordinances to protect farmer interests and balanced zoning laws to serve the well-being of area neighbors. Zoning matters, in combination with increased competition in the marketplace, has given many farmers reason to consider anaerobic digestion of animal wastes! Anaerobic digestion is a simple biochemical process by which waste products are converted to energy. Mixing acetogens and methanogens (acid and gas producing bacteria) with manure, plant waste, crop residue, food scraps or other waste products, farmers produce and capture biogas for energy use on-farm or for sale to local utilities. Anaerobic digestion works in a 2-stage process to decompose organic material (volatile solids) in the absence of oxygen. Biogas is produced as a waste product of digestion. In the first stage, the volatile solids in manure are converted into fatty acids by anaerobic bacteria known as “acid formers,” or acetogens. In the second stage, these acids are further converted into biogas by more specialized bacteria known as “methane formers,” or methagens. Key by-products of anaerobic digestion include digested solids and liquids, which may be used as soil amendments or liquid fertilizers. Methane, the primary component of “biogas,” can be used to fuel a variety of applications. If you’re a farmer exploring biogas, fuel supply (manure in our case) is critical for any project. The amount of waste depends on the type being produced. 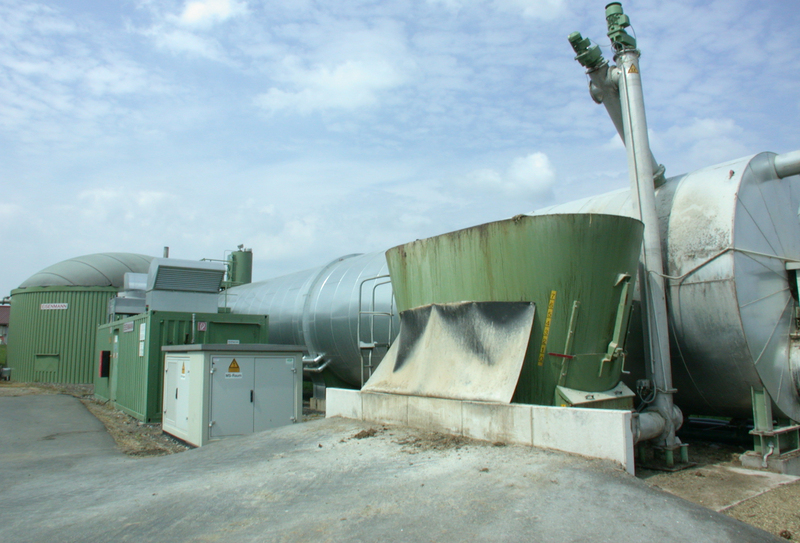 Wastes with high moisture content (greater than 75%), like cow manure, are typically processed using anaerobic digestion technologies, while drier wastes, such as turkey excrement, can be burned directly without anaerobic digestion. Another consideration is how the animals are housed. In a free-stall dairy where animals remain confined throughout the year, manure can be collected daily. If the animals are pastured in the summer, however, waste cannot be efficiently collected and the biogas project would only be operational during periods when the animals are confined. Furthermore, there are certain economies of scale associated with making a biogas project cost effective. Biogas, produced from anaerobic digestion (or just gasification), can be used to replace electricity, natural gas, propane, or fuel oil used for electricity, heating, or cooling. The most common approach to producing electricity is to burn biogas in a conventional spark ignition engine coupled to a generator. In addition to generating electricity, biomass can be used to produce space heat. The most profitable bio-gas energy projects generally produce electricity with waste heat recovery, in a process known as cogeneration. There are different types of digesters: Covered lagoons, complete mix digesters, and plug flow digesters. Covered lagoons are the least expensive type of digester. Lagoons can be covered to collect and flare the gas produced. But since the manure is not completely digested, lagoon digesters do not entirely eliminate odors. Furthermore, this type is not very effective in regions that experience a wide range of temperatures, like the Midwest, because temperature directly affects the production of methane and effective energy recovery requires equipment sized to a regular gas flow. Complete mix digesters consist of an engineered tank (round or square, which is located below or above ground; burying the tank helps insulate the system in cold weather states). The complete mix digester can use slurry manures with a solids concentration ranging from 3-10% and the volume of the tank needs to equal 15-20 days’ worth of manure and waste water production. The tanks are heated using waste heat recovered from the burner and mechanical mixers keep the manure in suspension within the tank as to prevent the formation of a surface crust. And finally, plug flow digesters are rectangular in-ground tanks where manure flows first into a mixing pit, allowing the solids content to be adjusted by adding water. The contents of the mixing pit are added to the tank daily, slowly pushing the older manure down the tank. This digester can only use manures with solids content between 11-13%, so it’s only compatible with dairy scraped manure. Building, operating, and optimizing biogas production systems takes work and is not right for everyone. Your regional climate, available feedstock and the ability to use gas at your site will determine if the project is viable. For more information, please visit www.mnproject.org or call us at 651-789-3330. Steele-Waseca Cooperative Electric (SWCE) has announced an innovated community solar program that allows cooperative members to purchase a subscription for a 410-watt panel for $170. The program called The Sunna Project, combines SWCE’s popular water heater program with community solar in an effort to make renewable energy economical for all cooperative members. To participate in The Sunna Project, a SWCE member will need to sign up for SWCE’s 16-Hour Water Heater Program where SWCE will provide the member with a 85- or 105-gallon Marathon electric water heater at no cost. Once on the 16-Hour Water Heater Program, SWCE members are eligible to purchase a single panel subscription at the one-time cost of $170 to SWCE’s community solar farm. Additional panel subscriptions are available to the member at the $1,225 per panel subscription. For members who do not wish to join SWCE’s 16-Hour Water Heater Program, subscriptions are also available for $1,225 per 410-watt panel. Community solar subscribers would see a monthly kWh credit on their energy bill reflecting their subscription portion of the total energy produced by the solar array during the previous month. Subscribers are entitled to the monthly kWh solar credit each month until June 2035. With the economical price, SWCE expects The Sunna Project to fill up fast. Additional information for The Sunna Project may be found on SWCE’s website or by calling SWCE staff at 1–800–526–3514. 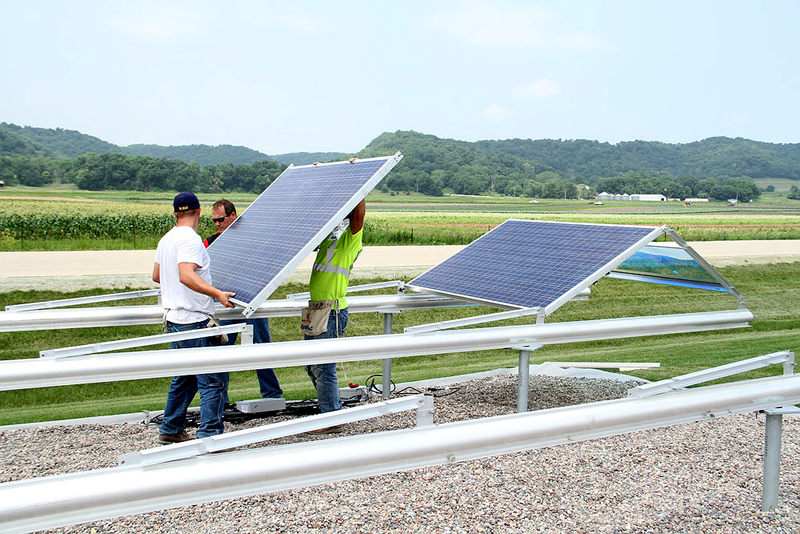 For general information on community solar gardens and working with your local utility, you may also check out Minnesota Clean Energy Resource Teams. Minnesotans have learned valuable lessons over the years with the 1st generation of biofuels (corn ethanol and bio-diesel, primarily). Fortunately, many of these 1st-generation biofuels challenges may be addressed by advances in the production of 2nd-generation biofuels (or advanced biofuels). Advanced biofuels are produced from non-food crops, especially from lingo-cellulosic feedstocks sourced from crop, forest or wood process residues. Like any early product or technology, advanced biofuels have experienced logistical and supply chain challenges. Nonetheless, projects are moving forward, and better yet, there are already commercial-scale cellulosic ethanol plants open for business throughout the U.S. Take, for example, “Project Liberty,” a joint venture of Royal DSM and POET, LLC. Project Liberty is based in Emmetsburg, Iowa, and converts baled corn cobs, leaves, husk and stalk—from farmland up to 45 miles away—into renewable fuel. At full capacity, it can convert 770 tons of biomass per day to produce ethanol at a rate of 20 million gallons per year. The plant employs 50 people directly and it has created another 200 indirect jobs in the community through biomass harvesting. Furthermore, Project Liberty will spend roughly $20 million dollars purchasing biomass from area farmers, providing them with additional revenue. At full capacity, it can convert 770 tons of biomass per day to produce ethanol at a rate of 20 million gallons per year. 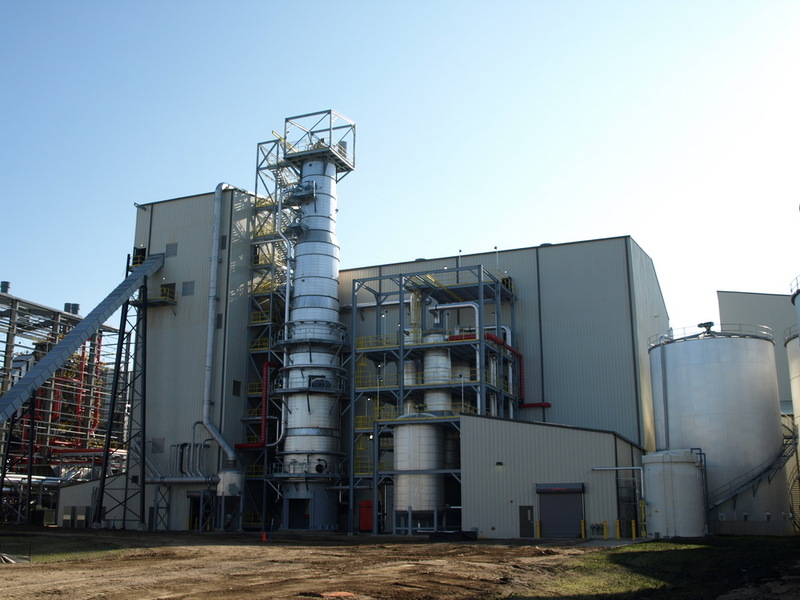 The Minnesota Project believes the plant (the first of its kind), serves as an exemplary step toward the wider adoption of advanced biofuels in America! The best way to get through winter is to spend it planning for spring. The Minnesota Project has been working on planting Edible Landscapes across the metro, transforming unused community areas into productive garden space. Our continuing goal is to increase the amount of fresh, healthy, and sustainably raised produce in our communities and in our local food shelves. By the end of this year, we will have planted a fruit tree orchard at Oxbow Creek elementary, built six garden beds for Evergreen Elementary School, and constructed five raised beds for Beth El Synagogue and Benilde-St. Margaret’s School (pictured below) all made possible by the Hennepin County Public Health Department Statewide Health Improvement Program (SHIP) funding. We plan to plant these raised garden beds in spring with vegetables, along with several other sites which are still in the developmental stage. For each of these Edible Landscape projects at least half of the harvest will be shared with a local food shelf, and some of the veggies being shared directly with the community. The selected space can be planted with an orchard, garden beds, or a combination of both depending on the preferences of the host site. Propane consumers are being hit with a “one-two” punch: a propane supply shortage from a flow reversal of the Cochin Pipeline, and what is shaping up to be a long, cold winter. Further, propane consumers do not benefit from utility efficiency programs and rebates because those programs focus on natural gas utilities, not unregulated propane suppliers. The rising cost of propane is hitting Midwesterners especially hard, where propane plays a much larger role in agricultural production. With this in mind, policy-makers have turned their attention to solar thermal technologies that will help mitigate against propane price spikes. Generally, solar thermal devices harness solar energy into thermal energy by collecting solar radiance in a medium – air under a glazed panel, or a liquid glycol solution – and transferring that heat into an existing hydronic or HVAC system. There are several types of solar thermal collectors, including: solar hot water, solar hot air (a/k/a solar furnace), and solar transpired air. Solar furnace and solar transpired air collectors are normally mounted on south-facing walls to maximize solar radiance capture, but may also be engineered to rest on rooftops (hyperlink with example). Hot air is then transferred indoors through conventional ducting. While solar air heating is suitable for all sorts of programs (commercial, industrial, multi-residential, institutional, etc. ), it is particularly appropriate for rural applications, especially when you consider the skyrocketing cost of propane. These applications include poultry and livestock ventilation and most importantly crop drying and processing (the most energy intensive operation of grain farming). Furthermore, solar air heating is capable of generating 7.3 million BTUs of thermal heat annually, the equivalent of 80 gallons of propane, significantly diminishing heating expenses. If you’re seriously considering the technology, I encourage you to visit the Rural Renewable Energy Alliance site. They both manufacture and install solar furnaces, with the possibility of financial assistance. I also encourage you to look into the Minnesota Department of Commerce’s Made in Minnesota Solar Thermal Incentive Program. For solar furnaces manufactured in Minnesota, individuals (or companies) can receive a rebate equal to 25% of the system installed cost up to a maximum of $2,500 for residential, $5,000 for multi-family and $25,000 for commercial systems. And finally, the Toronto-based engineering firm, Conserval Engineering Inc. is well known for their Solar Wall solar air heating product. I urge you to check out their chicken farm and swine farm case studies! Good luck and capture those savings! 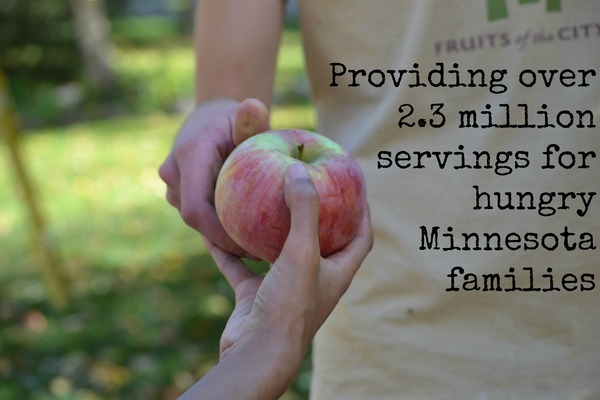 Our Fruits of the City program organized hundreds of volunteers to glean over 30 tons of fresh and healthy fruit for Minnesota food shelves and received the prestigious Environmental Initiative Award for Food Stewardship. Our Energy Program was an Environmental Initiative Awards finalist for our LED Lighting for Poultry project that will save poultry farmers over $2,200 annually in reduced energy consumption. Our Dairy Efficiency project partnered with 57 of Hastings Cooperative Creamery’s dairy farmers to help them identify and implement energy savings through the use of smart technologies and practices such as plate coolers, energy efficient lighting, variable speed drives and more. Our Garden Gleaning Project worked with area gardeners and farmers markets to collect and donate nearly 14,000 pounds of fresh vegetables to those in need. And lastly, as a result of our work with starting community orchards, school gardens, and our Micro-Farm, we’ve transformed over 12,000 square feet of unused space into edible landscapes. Our Micro-Farm, alone, has cultivated nearly 2,000 pounds of produce for The Food Group food bank. You can donate online now at our GiveMN page and join thousands of Minnesotans donating to their favorite causes today. You can also support us by sending a donation directly to our offices at: 1885 University Avenue West, Saint Paul, MN 55104. Along with any financial support you may be able to provide, your support of our social media efforts would be greatly appreciated. Please “Like” or “Share” our Facebook page. Or “Follow” or “Re-tweet” us on Twitter.